The Boxing Truth®: Can Pacquiao Rebound Against Rios? There is little doubt that Manny Pacquiao has become a box office superstar for the sport of Boxing. After an unprecedented winning streak that lasted over seven years, which saw Pacquiao climb up the weight scale to not only defeat men who were bigger than himself, but frankly dominate them in the eyes of most observers. This winning streak included victories over such notables as Oscar De La Hoya, Ricky Hatton, Miguel Cotto, and Antonio Margarito just to name a few. Prior to his controversial decision loss to Timothy Bradley in June 2012, there was a consensus among Boxing fans and experts alike that Pacquiao was certainly one of the two best pound for pound fighters in the world, rivaling only Floyd Mayweather in the eyes of most. Despite the controversial loss however, many did not consider the loss as damaging to Pacquiao in the sport’s mythical pound for pound ratings. Although Timothy Bradley was deemed to be the winner that fight, many did not consider it to be a legitimate victory over Pacquiao due to the controversial scoring of that bout. In the minds of many the only fighter who had come close to defeating Pacquiao since his 2005 loss in his first fight with Erik Morales was Juan Manuel Marquez. Marquez, who had fought Pacquiao in three close battles with a healthy difference of opinion as to who won those fights. Pacquiao earned close decisions in two of three of those encounters, having earned a draw against Marquez in their first fight in 2004. Although Pacquiao was victorious in two of those fights, those fights frankly could have gone either way. This fueled demand for a fourth fight between the two future Hall of Famers. In a fight that was just as exciting and just as violent as the previous encounters, the two warriors battled each other, unlike the first three fights however, Marquez who had been knocked down in two of the first three fights was able to turn the tables on Pacquiao knocking him down in the third round for the first time since his fight against Nedal Hussien in October of 2000 when Pacquiao was competing as a 122lb. Jr. Featherweight. Despite the knockdown Pacquiao was able to rebound and score a knockdown of Marquez in the fifth round. Pacquiao inflicted much damage to Marquez who suffered a broken nose during this contest and was a bloody mess. Pacquiao continued to punish Marquez for much of round six and seemed to have him in trouble when a sudden and devastating right hand by Marquez knocked Pacquiao out cold with only seconds remaining in the round. Manny Pacquiao had suffered his first loss since 2005 and his first knockout loss since losing the WBC World Flyweight championship to Medgoen Singsurat in Thailand in 1999. The loss to Marquez is viewed by most as the first legitimate loss Pacquiao has suffered since his first fight with Erik Morales. Now eleven months after suffering that devastating knockout, Pacquiao returns to the ring against rising star Brandon Rios in Macau, China on November 23rd. The obvious question that will face Pacquiao in this fight is what affect did the knockout at the hands of Marquez have on him? As a lifelong fan and in many years of covering the sport of Boxing, I have seen several devastating knockouts. Marquez’ knockout of Pacquiao ranks among the most devastating that I have seen. Although there is no dispute as to how devastating that knockout was, it is important to remember the sudden nature in which that knockout occurred. One could make a justifiable argument that Pacquiao was in control of that fight right up until it’s sudden and dramatic conclusion. Some have said that Marquez may have landed a lucky punch. This observer respectfully disagrees. Upon the knockout taking place thoughts began to run through my mind of an MMA bout between MMA legends Chuck Liddell and Rich Franklin that ended under similar circumstances which took place at UFC 115 in June of 2010. In that contest much like Pacquiao, Liddell had Franklin hurt and was caught by a right hand by Franklin which brought the fight to a sudden and dramatic conclusion with just seconds remaining in the first round. The similarity is that both Liddell and Pacquiao were caught by right hands as they pressed forward and walked into the punch. In both cases neither fighter saw the punch coming. There was no luck involved in either knockout. Much like Marquez, Franklin was able to capitalize on an opening that his opponent left him in a split second. 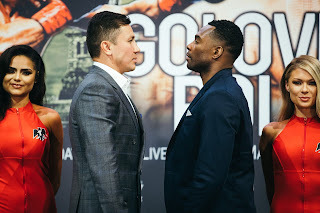 Much as this observer has said many times over the years that anything can happen at any given time in the sport of Boxing, the same holds true throughout all of combat sports. The one question that I have in my mind as this fight approaches is not only what affect did the knockout have on Pacquiao, but also if it will affect how he fights? What has made Manny Pacquiao so difficult for his opponents is his ability to throw punches from every conceivable angle and his ability to throw punches anticipation of where a fighter will move. He hits them where they ain’t. Pacquiao also has the ability to overwhelm opponents with speed do to his ability to use angles to set up his offense. It will be interesting to see if Pacquiao will take a more measured approach in his attack particularly if he is able to hurt Rios. For Rios this is the biggest fight of his career. Rios, who has previously held interim/regular status in the WBA’s Lightweight ratings has an exciting come forward pressure style and can punch. Rios has registered a near 70% career knockout ratio in his career and has scored exciting knockouts over the likes of Urbano Antillon, John Murray, and Mike Alvarado just to name a few. Rios comes into this fight following two exciting battles with Mike Alvarado, scoring a knockout win in the first fight in October of last year and suffering the first loss of his career via unanimous decision in the rematch, in his last fight in March of this year. A question that could be asked is what affect have those wars had on Rios as this fight approaches? Both Pacquiao and Rios have been through grueling battles throughout their respective careers, but it goes without saying that the toll a fighter goes through is different for each fighter. One has to wonder what toll those battles have had on both fighters. It will be interesting to see how Rios will deal with Pacquiao’s lateral movement and ability to use angles. Some may expect Rios to implement pressure from the opening bell and attempt to cut the ring off and neutralize Pacquiao’s movement. A task that has proven to be easier said than done for previous Pacquiao opponents. Rios did seem to have trouble in his April 2012 bout with Richard Abril. In that fight Abril used lateral movement to keep Rios at distance and seemed to get off first with his offense throughout most of the fight. Although Rios would score a controversial split decision victory, most observers this one included felt that Abril won the fight decisively. Even though the styles of Pacquiao and Abril are different, it will be interesting to see if Pacquiao intends to fight Rios in a similar way. Although some may feel that Rios’ style is tailor made for Pacquiao, Rios is definitely dangerous and should not be taken lightly. Pacquiao after all is coming off of a knockout loss and one might argue that he has more to prove than Rios in this fight. What looks to be an exciting fight between two exciting fighters was overshadowed somewhat earlier this week by an altercation that took place between Pacquiao’s trainer Freddie Roach and members of the Rios camp at a gym in Macau where both fighters are making final preparations for the bout. The dispute started when Roach asked Rios trainer Robert Garcia for his camp to leave due to it being the scheduled time for Pacquiao to train. Garcia and the Rios camp refused and it resulted in a physical altercation between Alex Ariza the former strength and conditioning coach for Pacquiao, now with the Rios camp and Freddie Roach. Video of the altercation showed Ariza kicking Roach in the chest resulting in a melee. Although it is understandable that tensions would be high so close to a fight where both sides do not care for one another, it is unfortunate when things like this happen. Some may believe that this was an attempt to somehow hype this fight, but this observer believes that if it was, it definitely wasn’t warranted and that this fight did not need any hype whatsoever. Hopefully the incident will not be what is most remembered when all is said and done. This fight potentially could be a fight of the year candidate. Both Pacquiao and Rios are warriors in the ring what more could the public ask for?